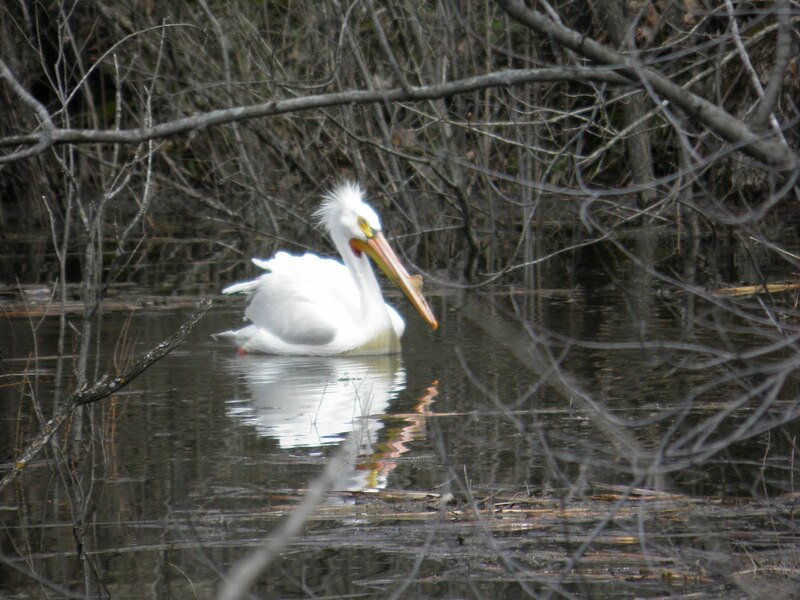 With the high water this Spring we are finding birds and waterfowl in unexpected places and very near to the road ... especially Sandhill Cranes and American White Pelicans. This fellow was in a small flooded area along Wisconsin State Highway 35 below Lock & Dam 5a & Fountain City. Because this was a newly flooded area, it was a challenge to keep the camera's focus off of the intruding brush and tree branches ... especially as he paddled deeper and deeper into the brush. SometImes we will see a pelican at Rieck's Lake but we usually find them deeper in the backwaters of Weaver Bottoms and you need a boat to get close enough for photographs. This was a great thrill!! !